Cambodia is a history rich and beautiful Southeast Asia country surrounded by Thailand, Vietnam and Laos. 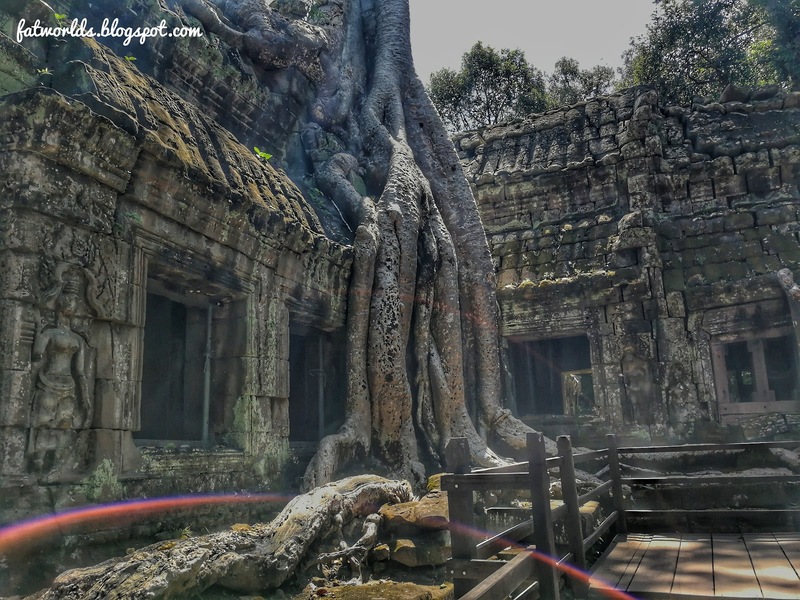 Among all the city in Cambodia, Siem Reap located in north-western Cambodia have always been on my bucket list. Free airport pick-up from our stay and 7USD for airport drop-off. 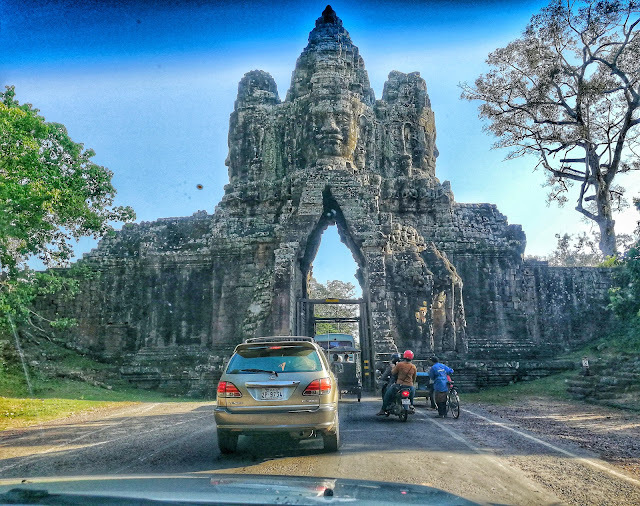 We rent private car (driver that pick us up from airport) for our tour - 60USD for both Angkor Wat Day Trip ($30) & Tonle Sap Road Trip ($30) for Day 1 and Day 2. As for city area, you can either travel by walking or tuk-tuk which cost 2USD per trip. *Glad that we met a driver who has been working in Malaysia for 10 years and able to communicate us (Please let me know if you need his contact). *As for tour guide and driver, both you can book from the place you stay. 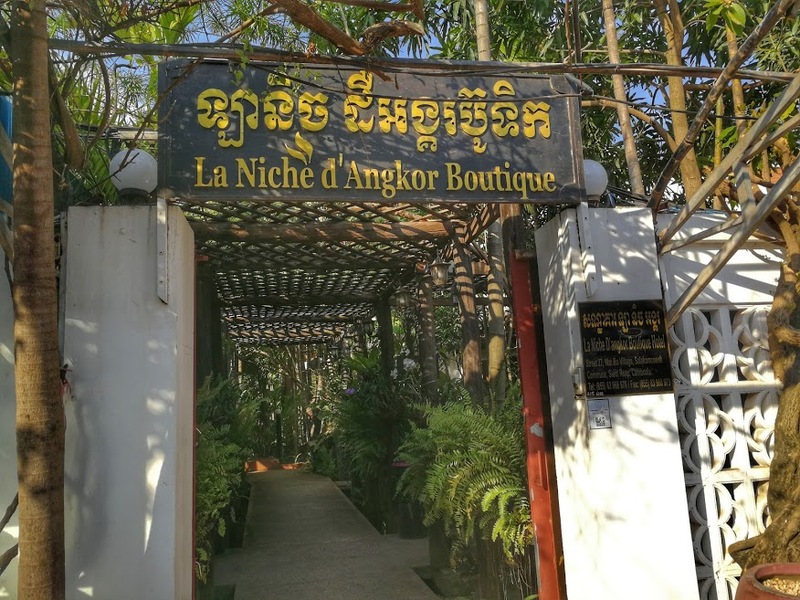 La Niche d' Angkor Boutique Hotel is a family-run boutique hotel built around the swimming pool and lush tropical garden. 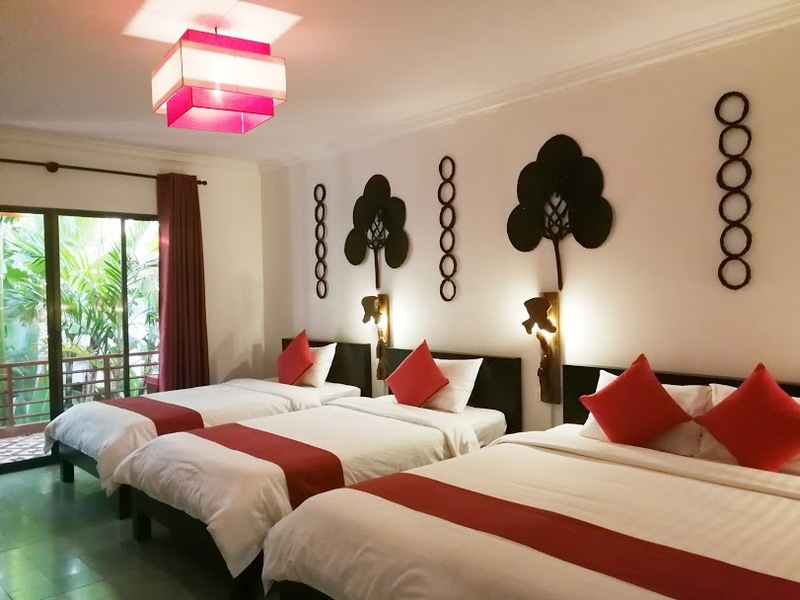 It is located in the heart of Siem Reap town just about 10-15 minutes walk to the Siem Reap City Center, Pub Street, Old Market and Shopping areas. 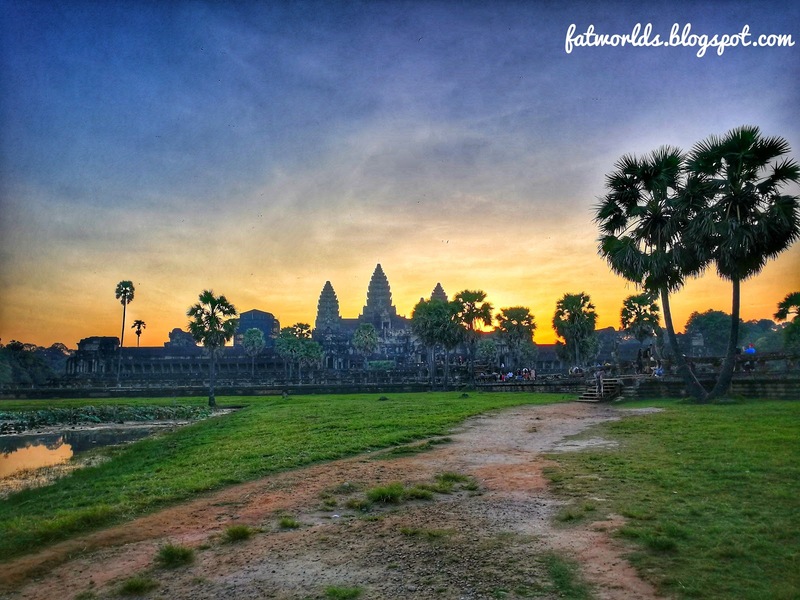 Cambodia is hot and stuffy all year round and the weather ranges between wet and dry season. The dry season runs from November to April would be the best time to visit Cambodia when the weather is warm and sunny but not too hot which makes sightseeing far more pleasure. While the wet season runs from May to October has its benefits too, painting the scenery a rich green color, offering a different reflection view in the pool around Angkor Wat and hotel are cheaper too. Anyway, the best time to visit does depends on what you are heading to Cambodia for. November to April: Avoid the rain but take on the crowds. 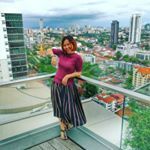 From Airport to City Center? Best way to get to and from the airport. 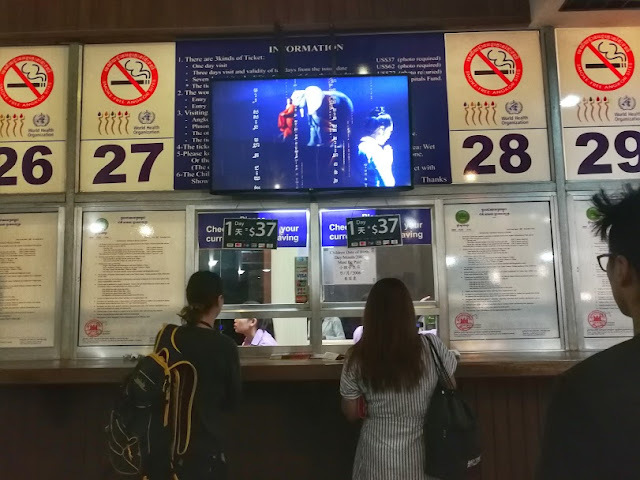 Price is set and has a ticket system. The official booth is located outside the airport’s domestic and international exit. Price approximate USD8 to city center. Price approximate USD 5 from airport to city center. Do check if your accommodation offers any free pick-up or drop-off this before you arrive. As out hotel offer free airport pick-up. Most visitors travel by this way. Each remork seats up to 4 person and the cost for short journey around town will be around USD 2-3 per remork. It can be hired for USD 15-20 per day for an Angkor Wat day trip, however the price may vary according to the distance and tour choice. 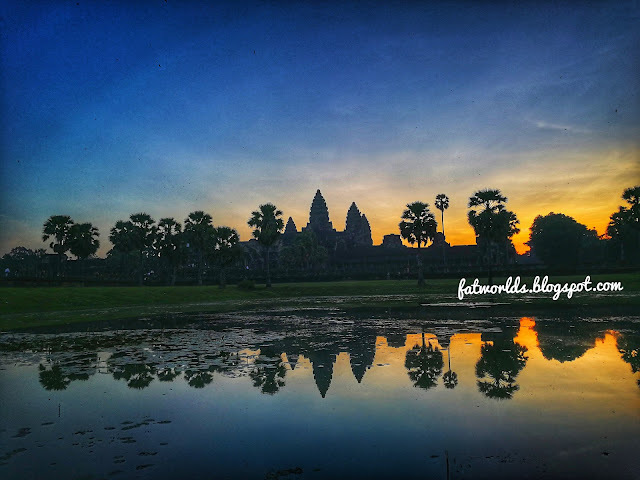 But according to the local, the usual cost will be around 15USD for Angkor Wat small tour trip (which will be covered later). 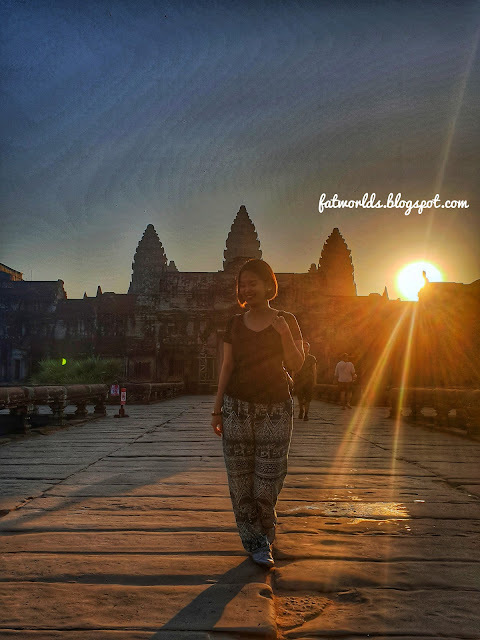 Do take note that, there will be an additional charge for sunrise trip. Hire a private vehicle or taxi from any of the reputable hotels and guesthouses in Siem Reap with a driver could be another option to get around Siem Reap. Rates start at approximately 30 USD per day. Bear in mind , it subjects to other surcharge for sunrise and distance. 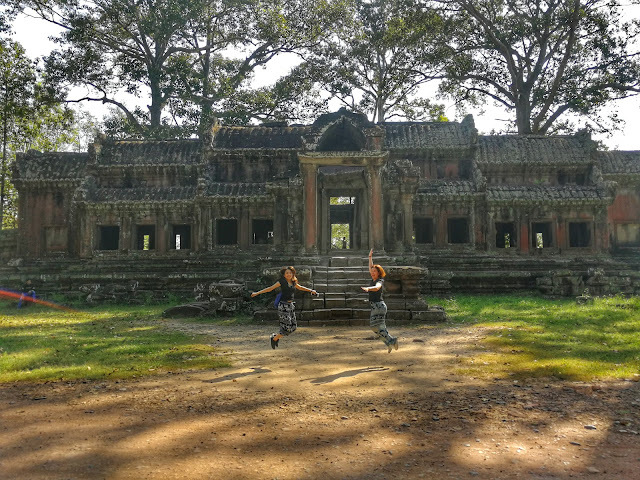 Cycling is another option if you're feeling adventurous. You can look for The White Bicycles, a non-profit charity providing over 50 rental bicycles to 9 hotels and guesthouses in Siem Reap, Cambodia. The rent will be 2 USD/day. Siem Reap is a place that can be explored by walking. All the temple requires plenty of energy from your two feet. If you staying very close to the Old Town/ Pub Street you may be able to walk around. Do take usual precaution, walk in group and take care of your belonging. The Angkor Ticket Office is the only place where you can purchase entrance tickets to Angkor Archaeological Park. Tickets purchased elsewhere are not valid. 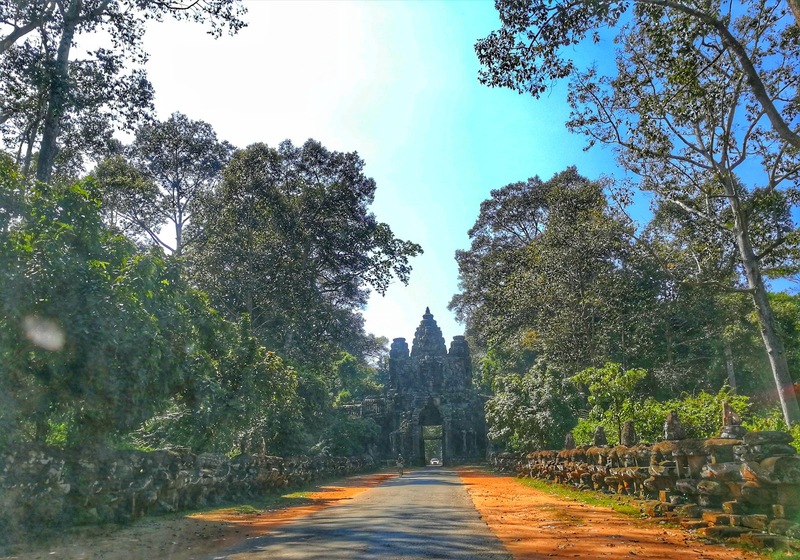 The entrance fee to the Angkor Archaeological Park depends on the type of admission pass that you choose. There are 3 types of passes available (*Ticket can visit all the temple except Kulen Mountain and Beng Mealea temple. 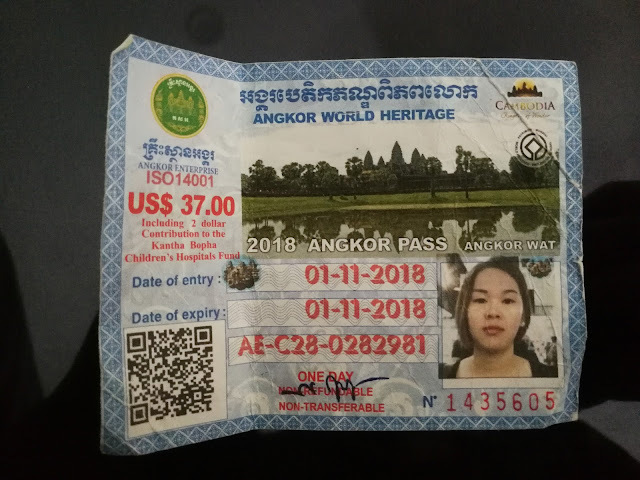 72USD for 7-day pass (validity of 1 month from the date issue). We purchased a one day pass for our visit and we are required to keep the ticket until we completed the whole visit. As you can see, your face is printed on the ticket so the ticket is not transferable to third party. Bear in mind if visitors are found without an entrance ticket or transferable ticket are subject to a fine. 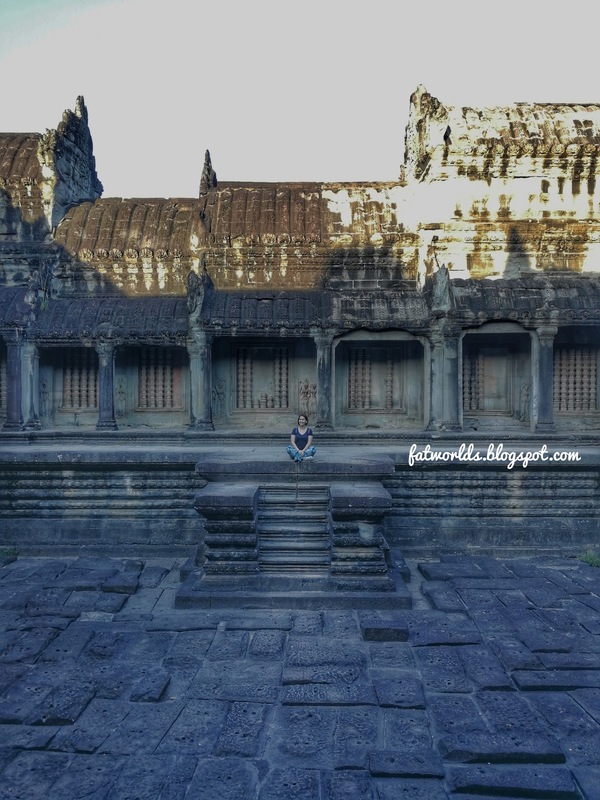 Angkor Wat, one of the largest religious monument in the world and the most magnificent example of the Khmer classical architecture. 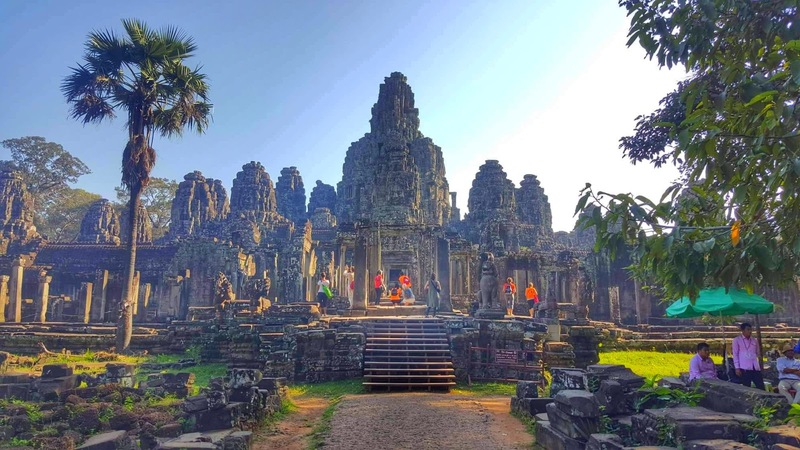 For this reason, it was listed as a world heritage by UNESCO in 1992 therefore it's has become one of the attraction in Siem Reap. The term "Angkor Wat" is a combination of two words "Angkor" meaning city or capital and the word "Wat" means temple or pagoda. 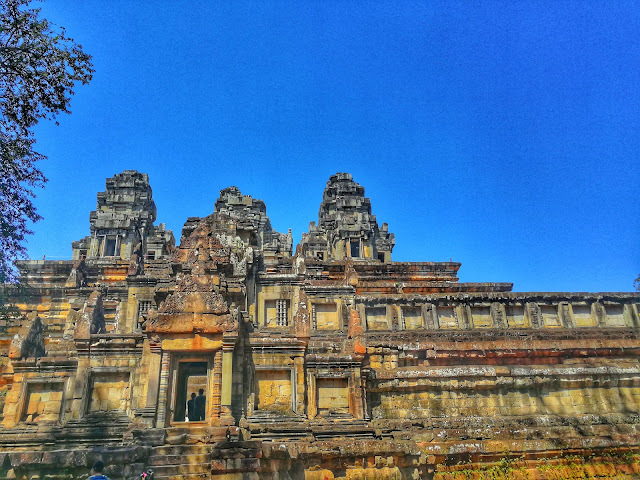 It was built as Hindu temple dedicated to Hindu god Vishnu in the 12th century, gradually transforming into a Buddhist temple around 15th -16th century. 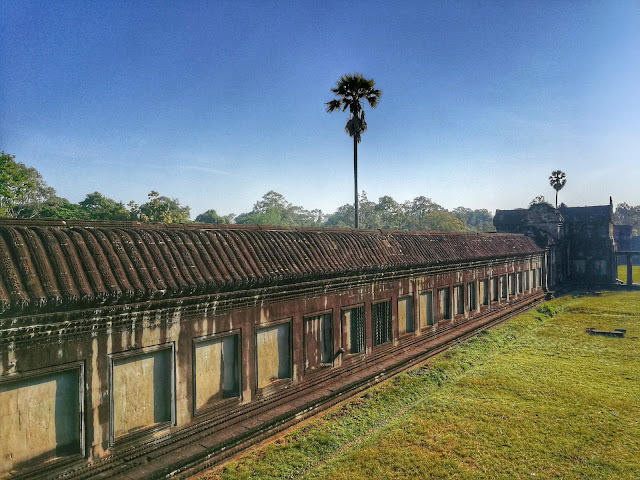 It's built on a vast, rectangular expanse of land covering the total area of 1300 by 1500 meters. 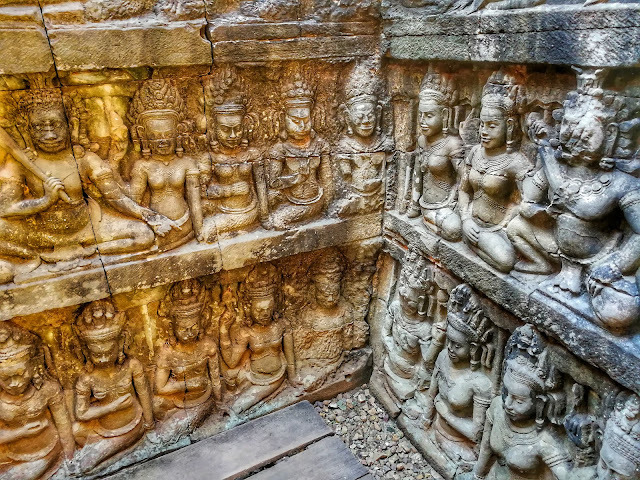 The design was built to represent Mount Meru, the mythical home of Hindu gods. 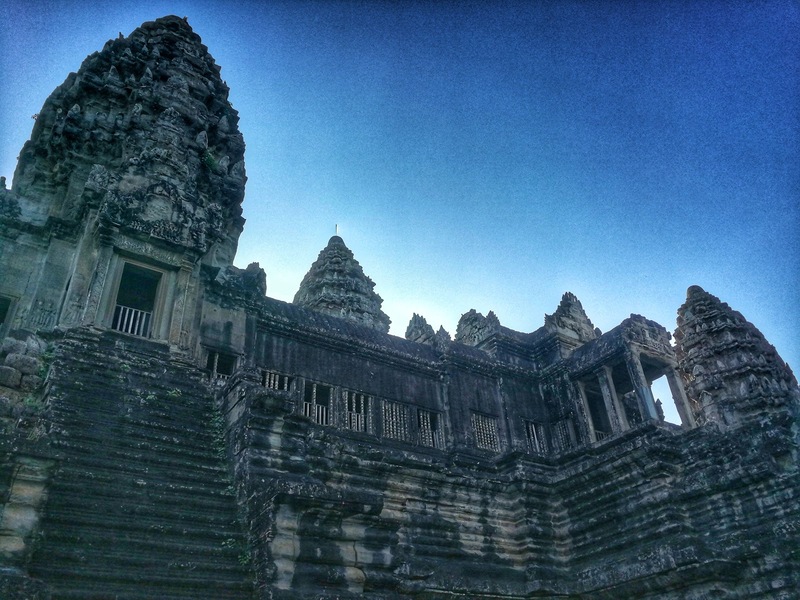 The five towers correspond to the five peaks of Mount Meru while the outer gallery of the monument and surrounding moat represent the mountain and ocean. 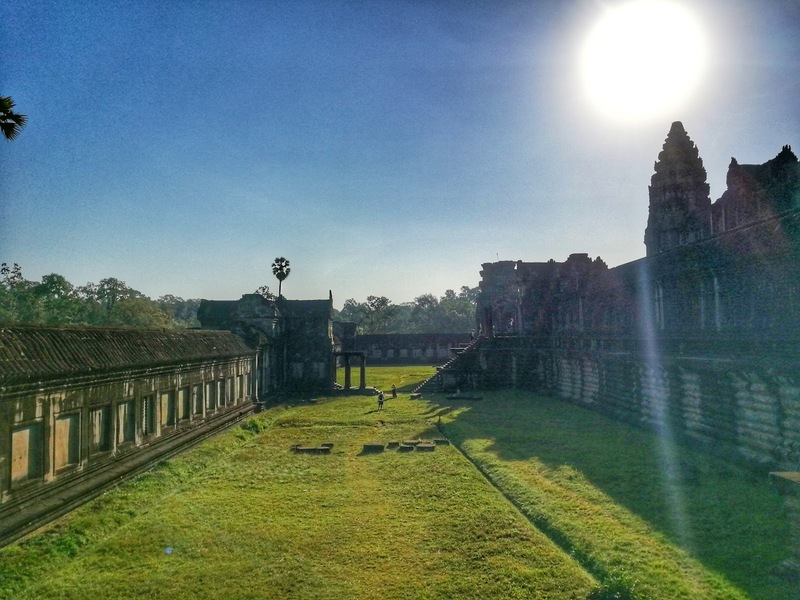 Apart from that, Angkor Wat is oriented to the west while other Angkorian temples facing to the traditional east. 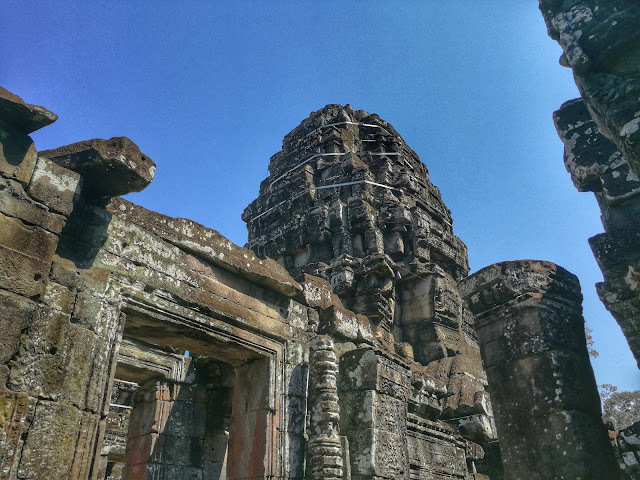 One likely explanation is because this temple is dedicated to Vishnu who is the god of west or it's associated with the direction of death. 2) The driver will drop you at the west entrance (Main entrance) and you're required to walk in dark before reaching the sunrise spot. Just walk with the large crowd with a flashlight and you will make your way there. 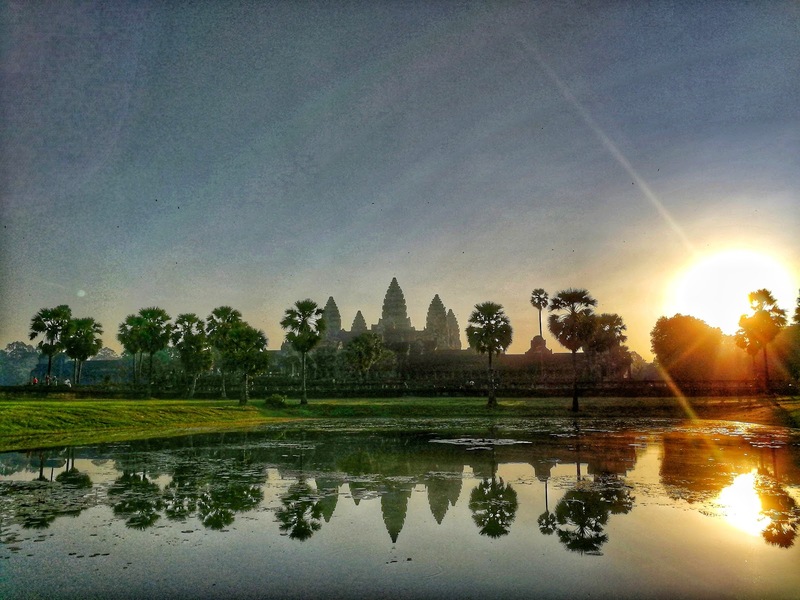 3) Once you're actually at the temple, you will be seeing a reflection pool and it seems to the spot of choice for sunrise. There will be two reflection pool, one on the left hand side and one on the right. For the best view and photo, I personally feel the left pool will be a better choice. 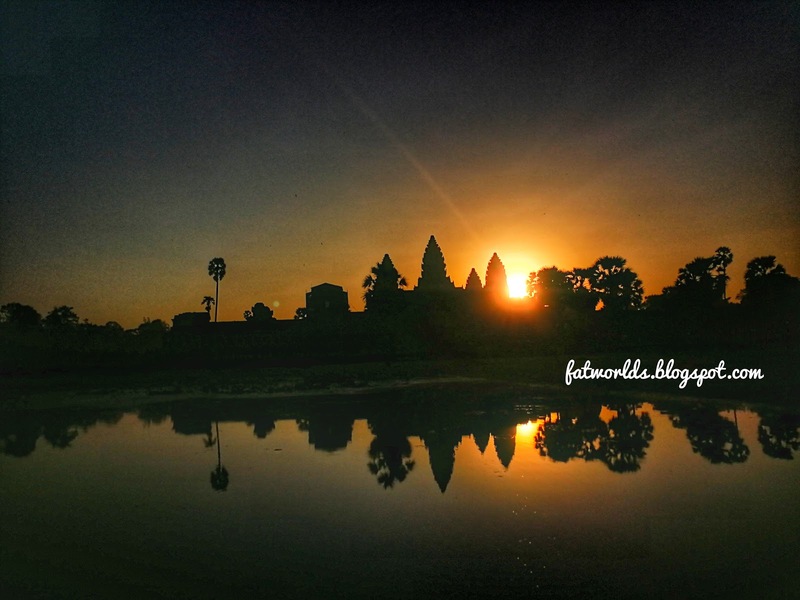 4) Remember to hire a personal guide to help you understand more about Angkor Wat. 5) Remember walk all the way to the east gate of Angkor Wat. The east view is as beautiful as the west (main entrance). Significantly less crowded so it's much more serene. 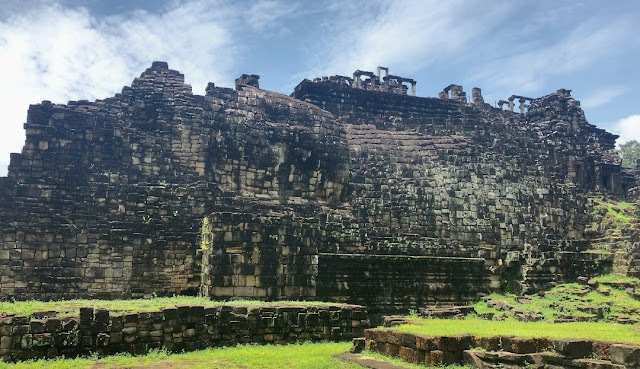 Banteay Kdei, also known as "A Citadel of Chambers, a buddhist temple constructed under the reign of the king Jayavarman VII at the end of century dedicated to Mahayana Buddhism. 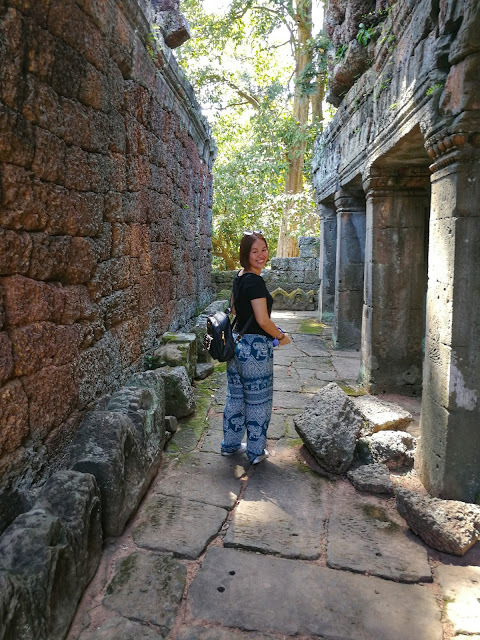 It's a smaller and quieter temple mainly built out of sandstone and free from tourist crowd. 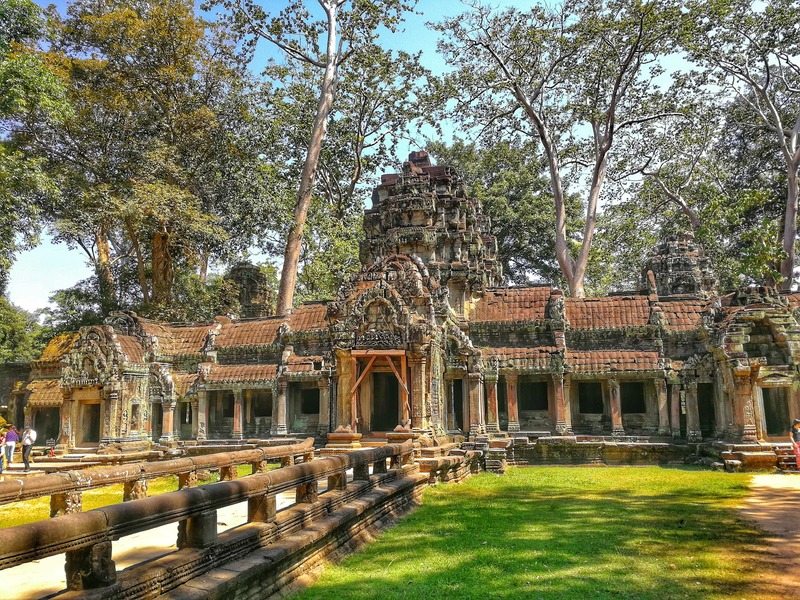 Inside of the temple, it looks like a maze and consist of many low doorway. In 2001, 274 fragment pieces of Buddha Statues were unearthed here. 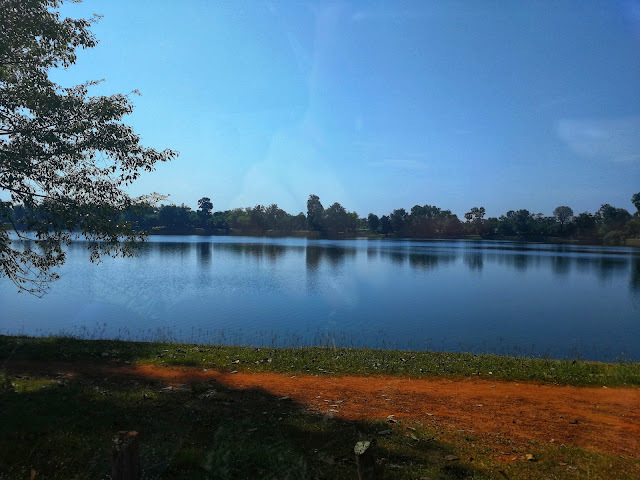 Above picture is Srah Srang, it is a man-made reservoir that used to be the royal bathing pool. 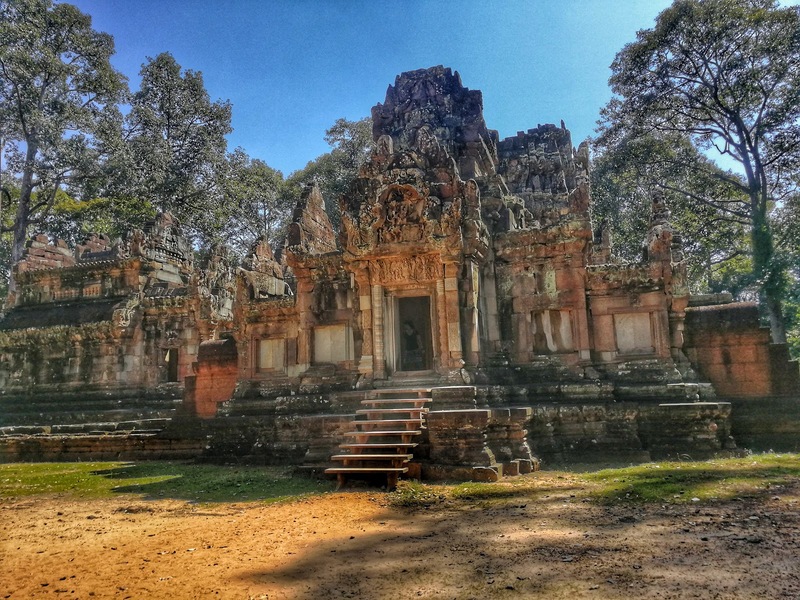 It is located opposite the east entrance of Banteay Kdei so you can have a combine visit with Banteay Kdei. Another must visit temple. 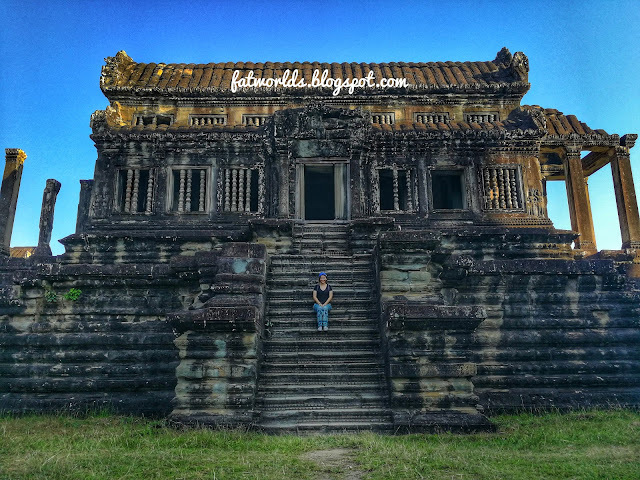 It was a Buddhist temple built from 1186 by the King Jayavarman VII and dedicated this temple to his mother. 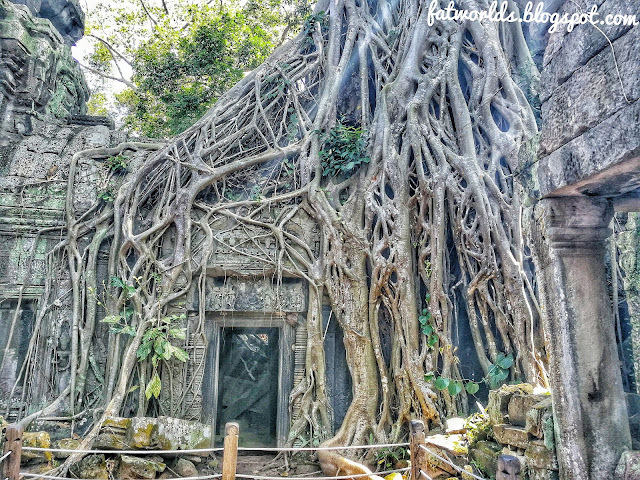 It's an interesting and beautiful temple, you will be impressed by how Mother Nature reclaims the temple. 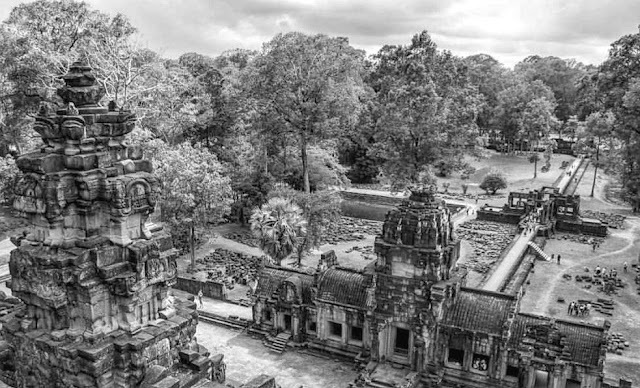 Not to mentioned, another reason Ta Phromn temple is famous for is that the movie Tom Raider was filmed here. 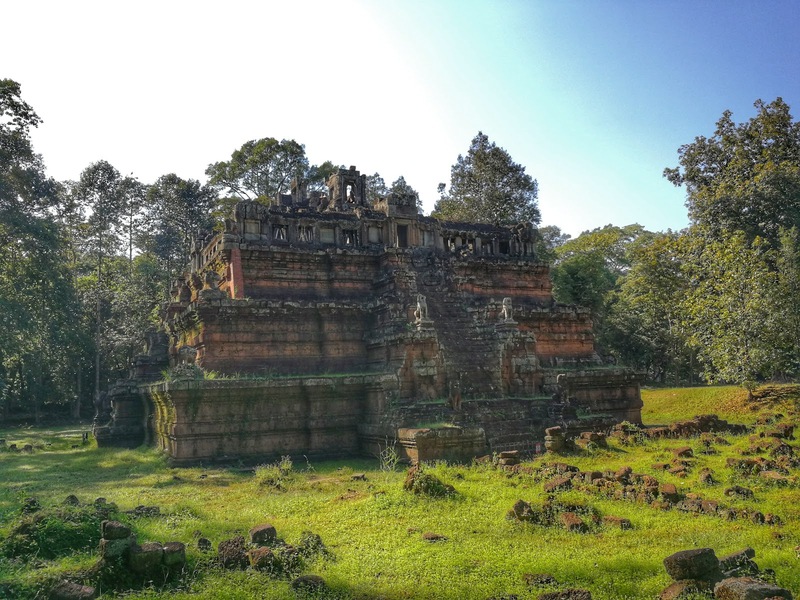 A square pyramid shape temple and it's the first major temple finished entirely in sandstone. Personally, I found it's an impressive monument that you can visit without having to deal with the crowd. The impressiveness comes from the incredibly steep stairs that I have never ever seen anywhere. So, if you are scared of height you can try to challenge yourself like what my friend and I did. Little temple at the small circuit located at the east of Angkor Thorm. 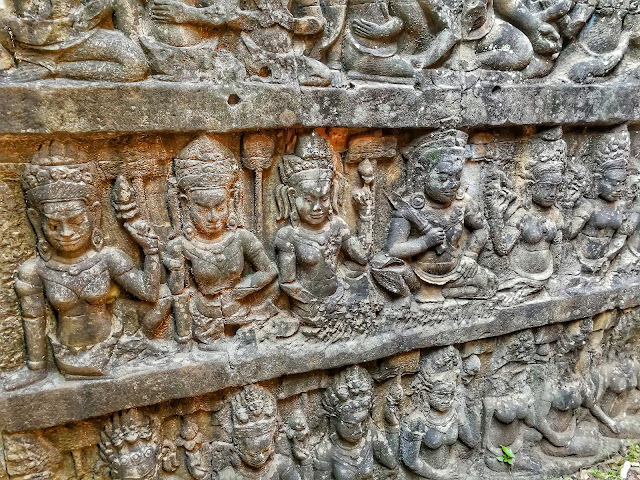 It's well-preserved and reconstructed. 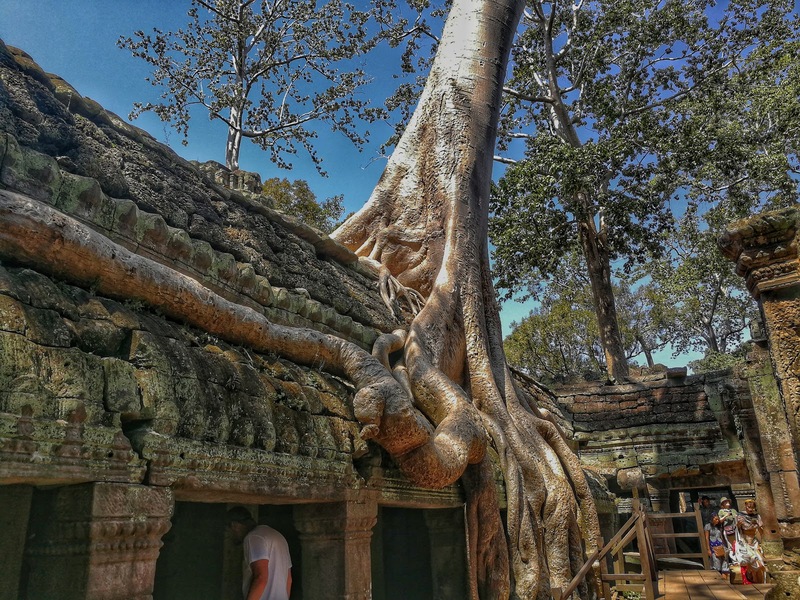 The temple has four gopura, two libraries and one causeway leading to Siem Reap River. 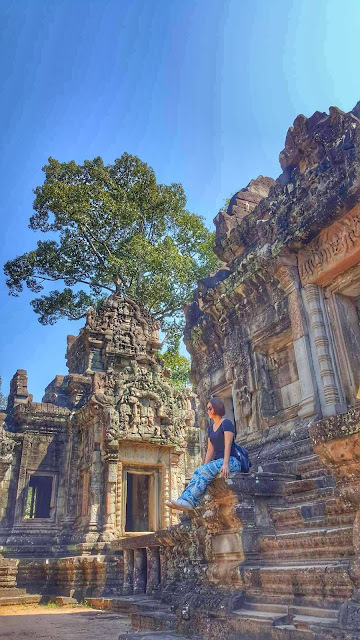 It's a quiet temple so you are able to take some nice photo here. If you have extra time, you can visit the Thommanon Temple across the road. Angkor Thom literally means " big city" is the "Great city" built by the ancient Khemer as their capital city and it's the last capital of the Khemer Empire. 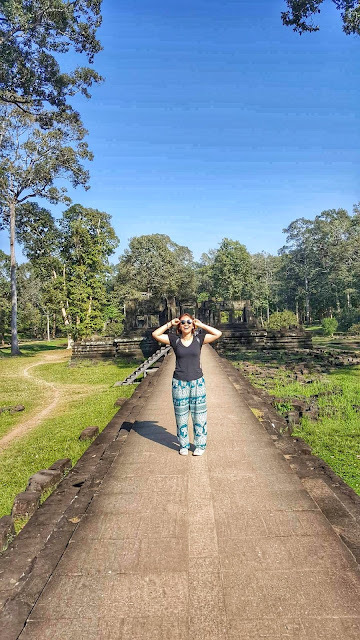 In Angkor Thom, there are 5 gates and causeway to Angkor Thom. The center tower/entrance gate is 23 meters in height, flanked by 2 smaller towers. 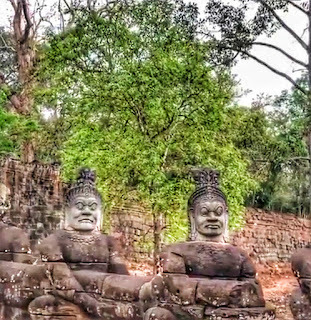 The towers crowned with four large faces similar to Bayon look out to the four cardinal points. 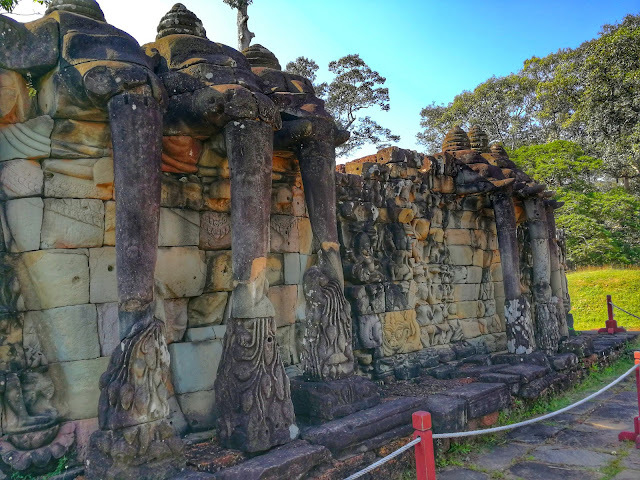 The causeway that linked to the gate is flanked by 108 statues, 54 heads of gods and demons on each side with demons on the right and gods on the left. 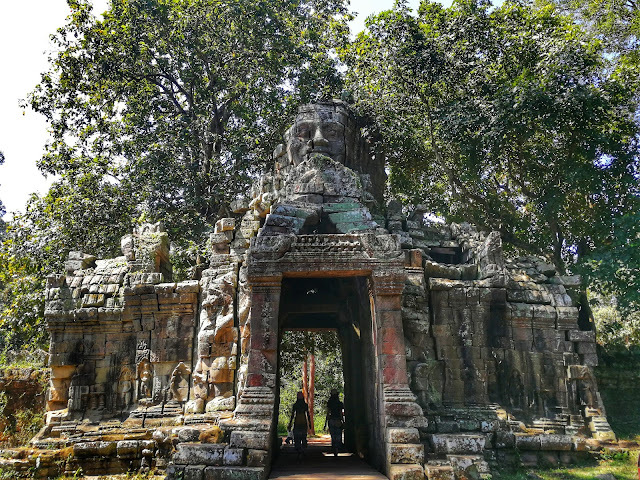 Among the 5 gates, south gate is the most well known and it's usually the main entrance for tourist to enter the Angkor Thom. 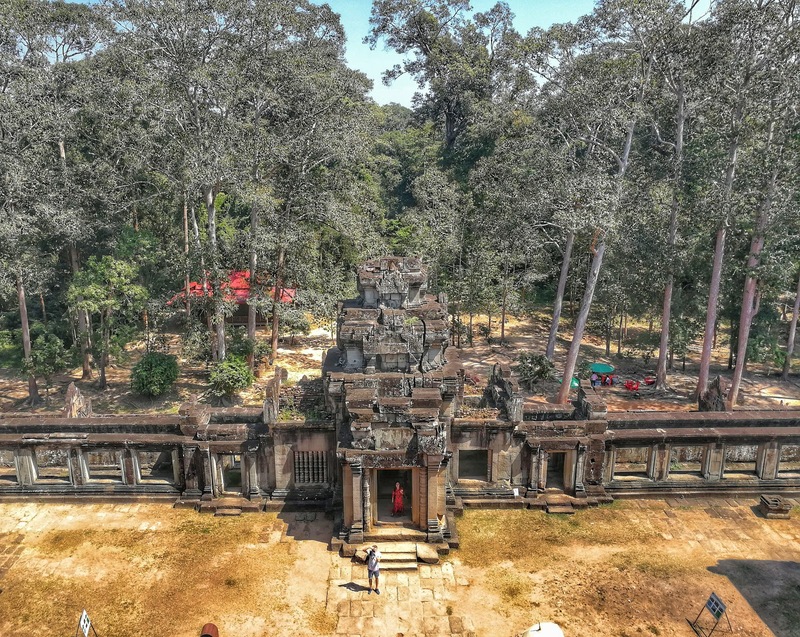 One of the most iconic temples in the heart of the ancient city of Angkor Thom. 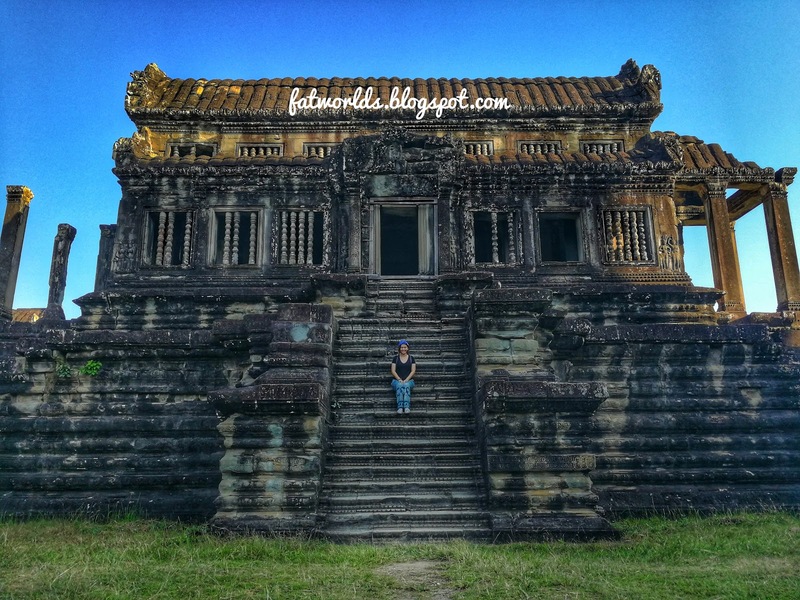 It is a Buddhist temple built in the late 12th century. 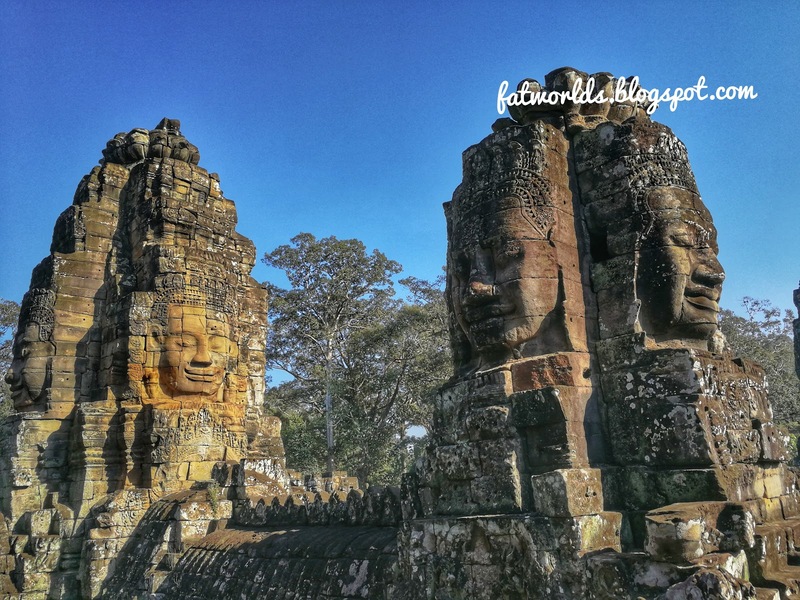 The smiling stone face on the tower is the most recognizable features attracting tourist of the Bayon temple. At Bayon temple, you get to see close to 200 faces and the largest ones being almost 2½ meter height. A temple located around 400m with a 5 min distance walk from Bayon Temple. It's the largest temple of Angkor and it's built in a pyramid shape representing the mythical Mt Meru. 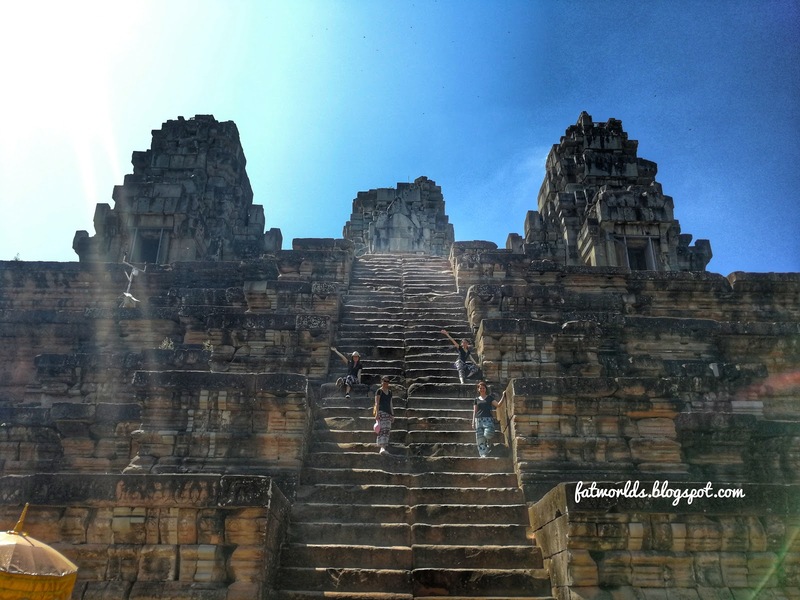 Some climbing is required for this temple but all the climbing will definitely worth it due to stunning view. 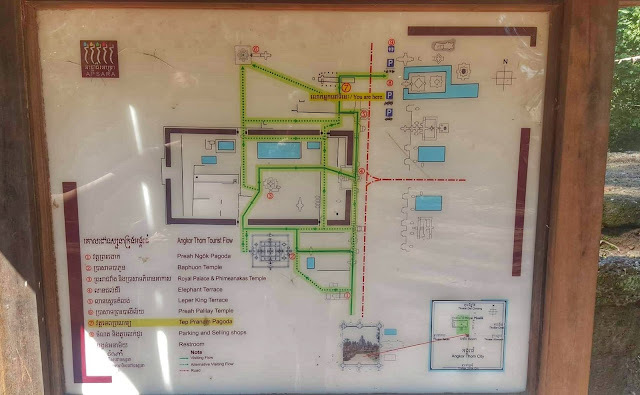 Not to mention, remember look for the gain reclining buddha, 9 meters tall by 70 meters long and it covers the second level located at the west side of the temple. 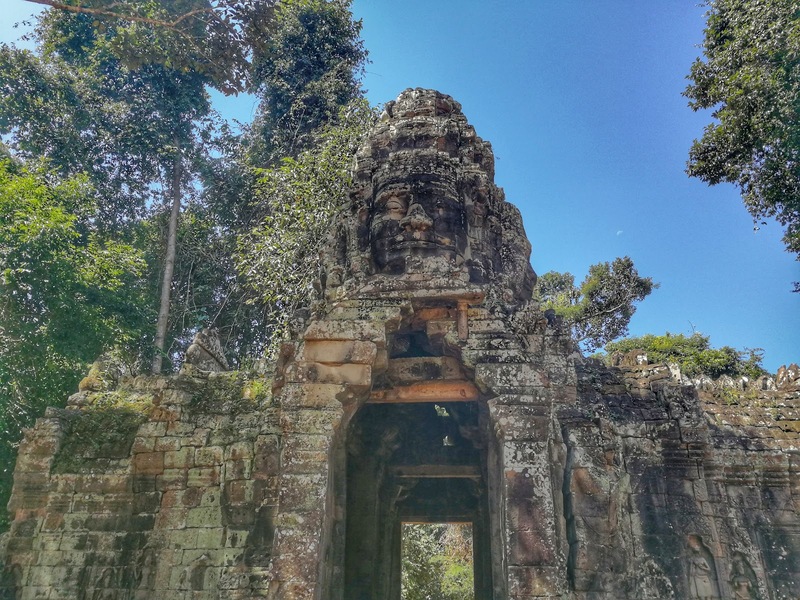 Phimeanakas Temple also known as Celestial Temple, a Hindu temple inside the walled enclosure of the Royal Palace of Angkor Thom north of Baphuon. Personally, it is more interesting historically than visually. According to Zhou Daguan, the chinese diplomat, a belief associated with this place is in the tower lives a nine headed snake spirit. Every night, it would take the form of a beautiful serpent-woman and the King had to sleep with her in the tower. If the king fail to do this for one night, a great disaster is to strike the Kingdom. In case the spirit fails to appear, the King is about to die. 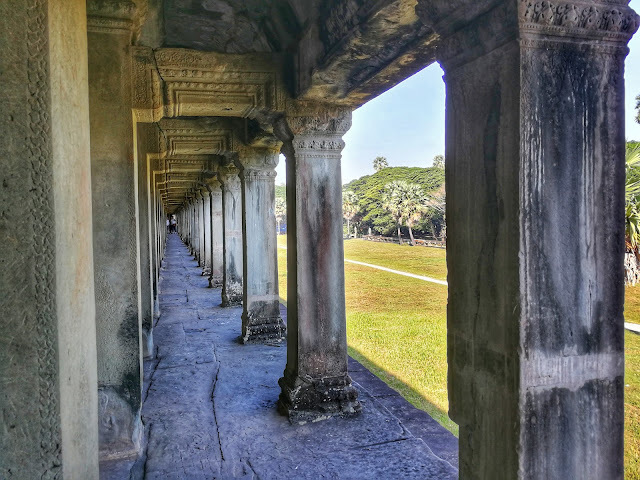 Terrace of the Elephant is a 2.5m height and about 300m long terrace built by King Jayavarman VII at the end of the 12th century as a view platform to view his victorious returning army. The about 300m long terrace is served as a public ceremonies and the king's grand audience hall. 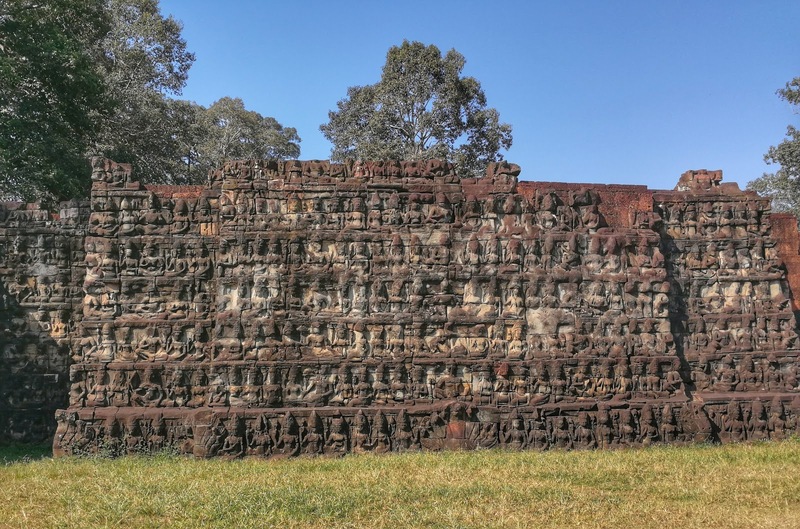 Terrace of Lepar King is a 7m high platform located north of the Terrace of Elephant. A headless statues known as "Lepar King" was found on top of the structure. There are several version of the origin of the name (Lepar King), one believe that is the king (King Jayayarman VII) suffered from leprosy and other believe that the statue might represent Yama, the God of Death. On the second day, we visited to Tonle Sap which is also known as"Great Lake" and it is the largest lake in Southeast Asia, covering an area of around 250,000 hectares in the dry season. 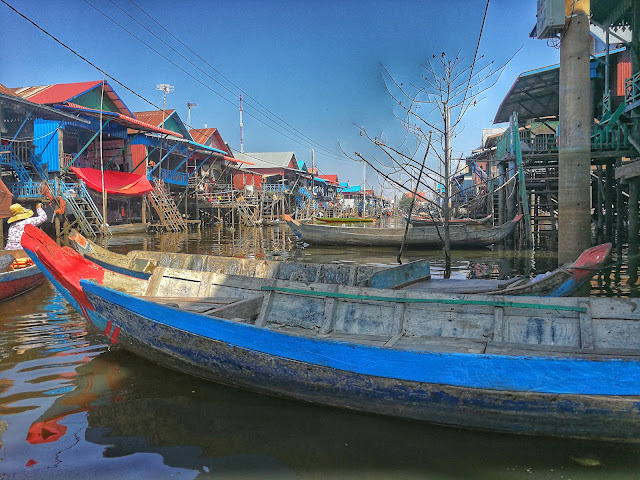 Apart from Cambodians, Tonle Sap is also home to a lot of Vietnamese, who migrated to Cambodia in the 20th century who make their living by fishing and selling on boat. In 1997, UNESCO recognized Tonle Sap Lake as a biosphere reserve in the world. 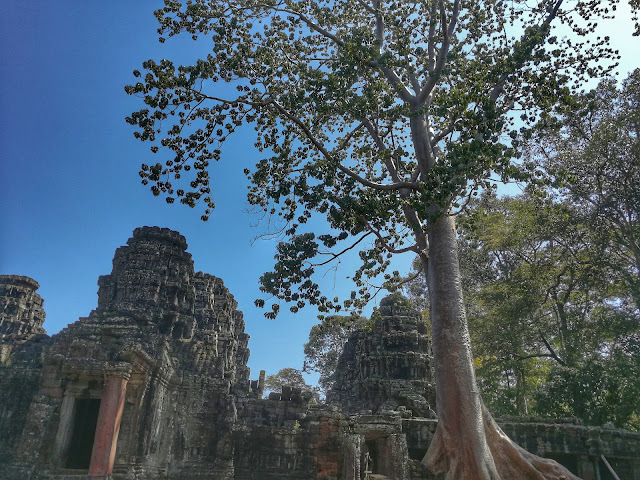 The best time to visit will be during the rainy season (July- October), where the lake of is surrounded by vivid green tree while the higher water levels mean better access to floating villages and flooded forests. 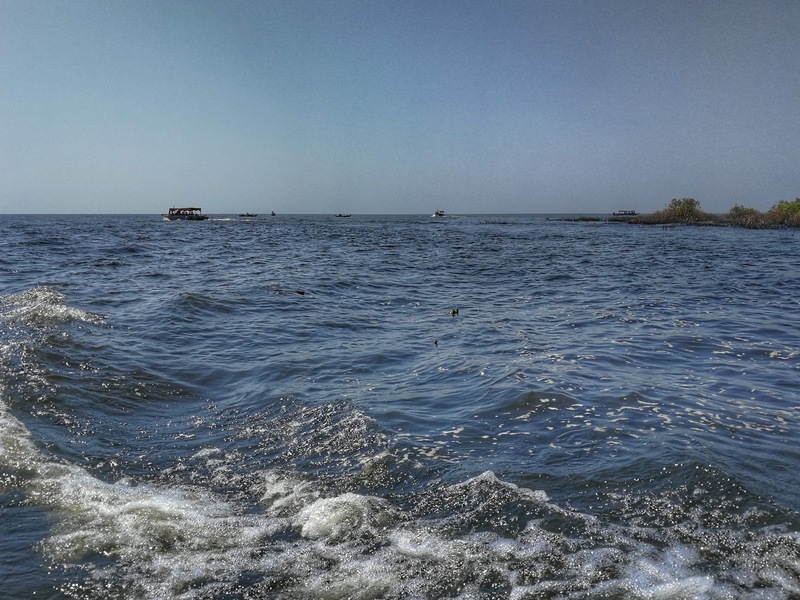 As for dry season (November- April), the lake becomes very shallow which cause difficulty for the boat to move. But not to worry, there's another option to visit the place where you can either choose to walk or ride a bike down the dirt roads through the neighborhoods. 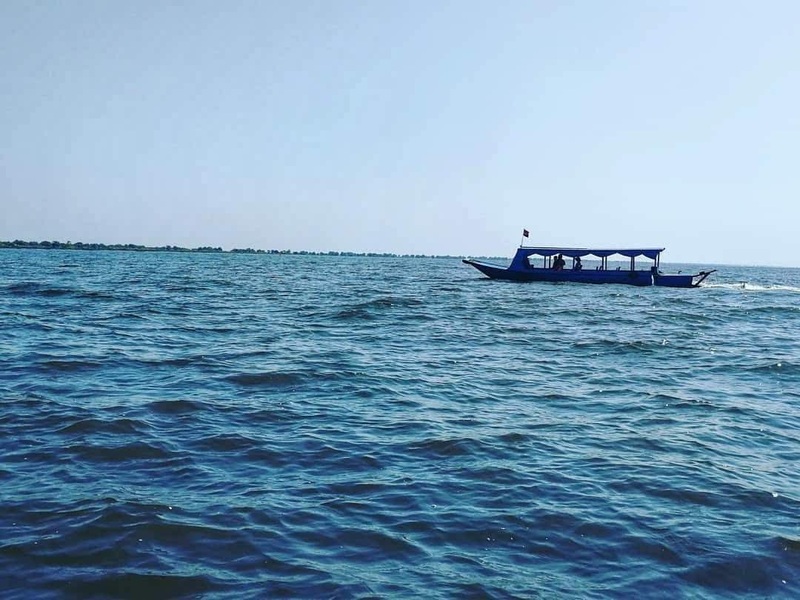 Tonle Sap is about 25 km from Siem Reap, you can get to Tonle Sap either by private car which will cost around USD30 or by tuk tuk which costs about USD 15. It takes about 30mins to an hour. Once you arrived, you have to purchase a boat ticket which cost USD 20 to reach the lake and your desired floating village. From the picture above, calling a lake does not justice to its massive size. In fact, it looked more like an ocean instead with the strong wind and waves. 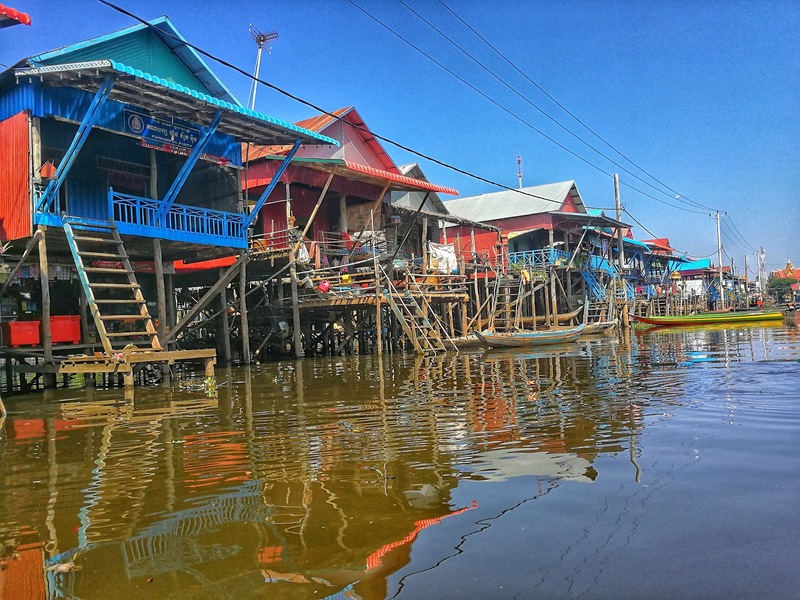 In Tonle Sap, there are main four village open to tourism which are Chong Kneas, Kampong Pluk, Mechrey, and Kampong Khleang. 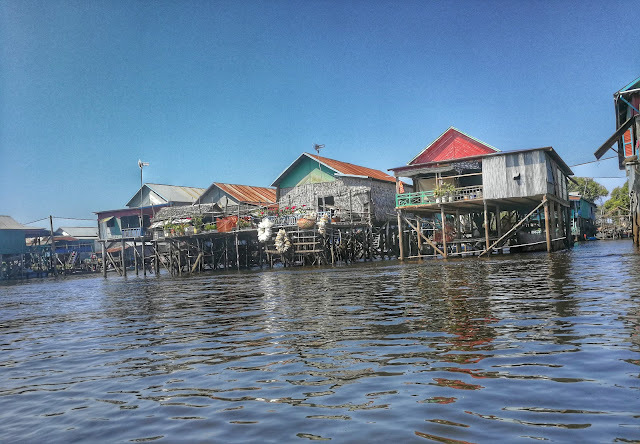 From the four villages, we choose to visit to Kampung Phluk. 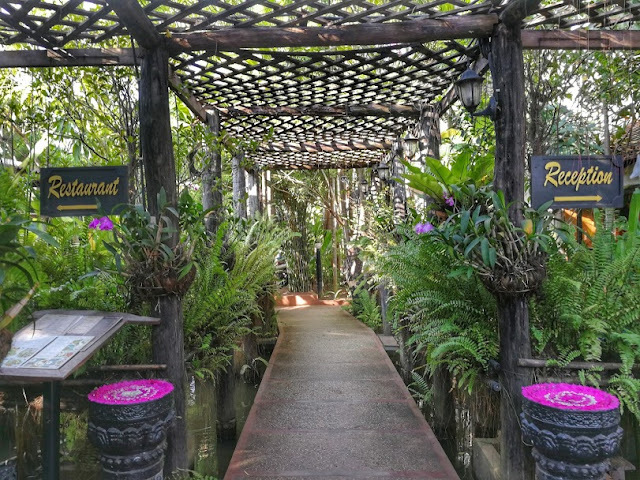 The reason we choose Kampung Pluk instead of Chong Kneas is because it's less touristy which has helped it retain much of the authenticity, not over commercialized and it's recommended by our driver as well. Kampung Pluk, a larger compound consists of 3 villages. Here, you will be able to find homes sitting on stilts over 10 meter high. 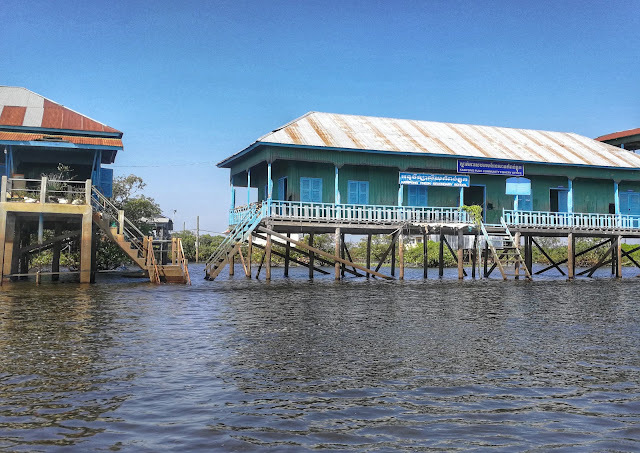 During the wet season, the water rises up to the bottom of the houses making them appear floating. 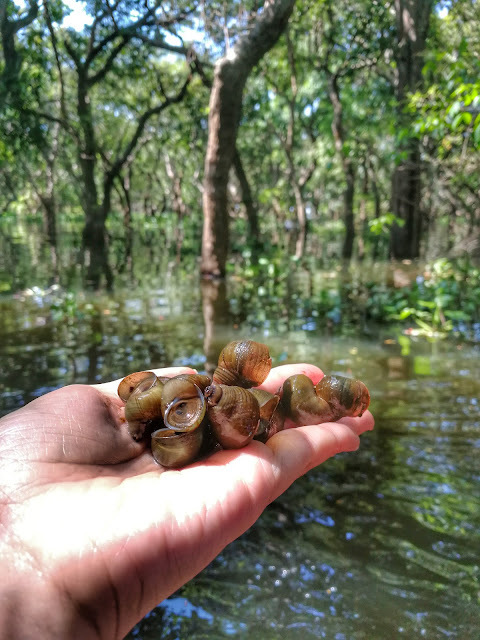 Local in Kampung Pluk farm crops during the dry season and fishes for fish and shrimp during the wet season. 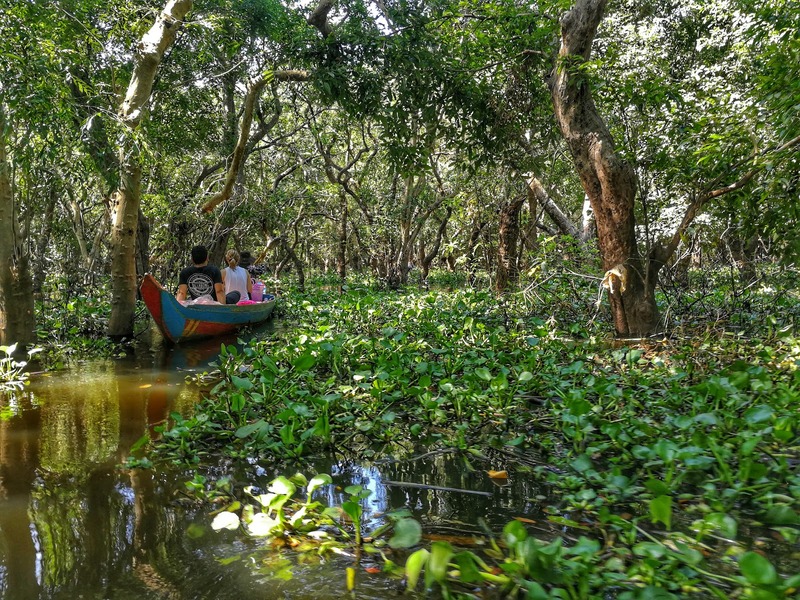 In addition, you are able to take small paddle boat into the mangroves with a guide to have a close look at this submerged forest. Through the visit of Tonle Sap and floating village, it was an eye-opened and humbling experience to see how happy and contented they are with just the basics in life. Overall, Siem Reap is an awesome destination not to be missed. 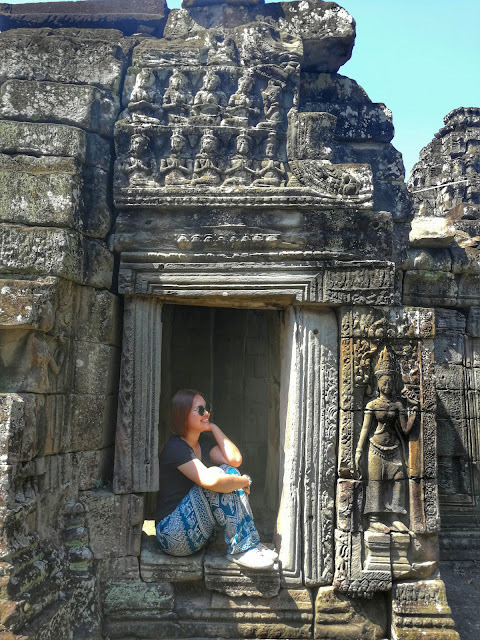 I hope my article will be useful for some of you when you guys are planning to pay a visit to Siem Reap even though I am not an expert of that. Any comment or question, feel free to do so in the comment section below.